Today we bring you word of a California based organization called Bolder. Their mission is simple: partner up with with great businesses in order to challenge people to do something good. When people do it, the businesses reward them. Sounds simple enough, right? 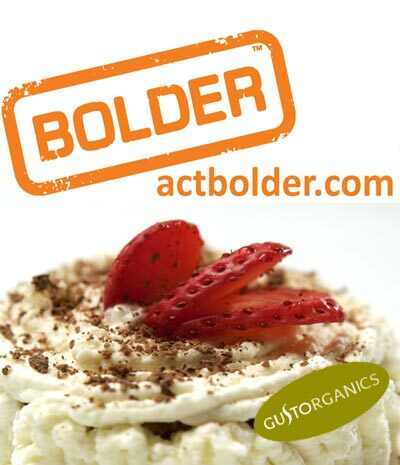 This week Bolder is working with Gust Organics (519 6th Avenue). When people come to the Bolder website and mention that they 'ate an organic food,' they'll earn themselves a free organic dessert (the coupon will be emailed to you via Bolder). This challenge will be live until August 15th. You can sign up to participate here. Right now, Bolder runs one national challenge starting every Monday (recent partners have included Whole Foods and Equinox). You can check out this week's national challenge from Gaiam (did we hear free yoga?) on the Bolder homepage now. Follow Bolder on Facebook and Twitter to stay in the loop about their latest challenges! This is a sponsored posting from Bolder.